What’s petite, delectably indulgent and a cheerful treat to all senses? A cupcake of course! The cupcake evolved in the United States in the 19th century, and was revolutionary because of the time saved in the kitchen. In the beginning, cupcakes were sometimes called “number” cakes, because they were easy to remember by the measurements of ingredients it took to create them: one cup of butter, two cups of sugar, three cups of flour, four eggs, one cup of milk, and one spoonful of bicarbonate soda. 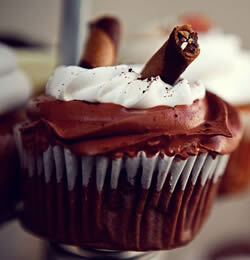 Today, cupcakes can be considered delicious works of art, with a variety of ingredients, measurements and decorations. From the simple vanilla cupcake to the fancier, red velvet and raspberry meringue cupcakes, these little heavenly cups of goodness have become a pop culture trend in the culinary world. If you are looking for the perfect ‘cupboard must have’, to make all your cupcake fantasies come true, try Staffords delicious baking range!